How to cancel train ticket at railway station? Where can I return the unused ticket in China mainland? How can I get refund? A. I booked a paper ticket and received it at my hotel already, but I need to cancel it now. Firstly, Bring your original passport and the unused paper ticket to a railway station nearby before the ticket's departure time. If you cannot go to the railway station in person, you can ask your friend to do it with his or her passport or citizen card and a photocopy of each passenger's passport. 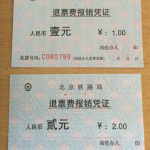 Then return the ticket at Refund Counter (退票窗口) before the train leaves. No refund will be given after the departure time. Get refund in cash at counter. B. I booked an e-ticket and redeemed it already, but now I want to cancel it. Bring your original passport and the unused paper ticket to a railway station nearby before the ticket's departure time. If you cannot go to the railway station in person, you can ask your friend to do it with his or her passport or other valid official travel document. Additionally, a photocopy of each passenger's passport is required. Return the ticket at Refund Counter (退票窗口) before the train leaves. No refund will be given after the departure time. The counter will give you the receipt (see the pictures bellow). Finally, please make sure to take a photo of the receipt and send it to service@chinaticketonline.com. 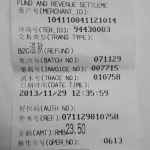 We will refund the money back to your card once we have received the receipt photo. Otherwise, you may not be able to receive the refund in time. Can you please tell me where is the refund counter of train station? Can you please cancel the train tickets for me?